Taking care of your gums is a large part of oral care. Brushing your teeth and flossing helps keep your teeth cavity free, but attention needs to be paid to the gums, as well. Your gums help keep your teeth in place, but can harbor unhealthy bacteria. If your gums are not healthy, it can affect your teeth, and your overall health status. This article will give you some helpful tips on improving the health of your gums. Healthy gums takes time and patience. If you are running out the door in the morning and only have time for a quick brushing, make sure you set aside some time each day to take care of your gums. Brushing should include attention to your gums, and you can schedule in some time later for these extra points. Debris from food can harbor bacteria near your gums. A hard crusty substance known as plaque, can also build up and trap bacteria under the gums. Floss your teeth and get down into your gum line a few times a day. Even once a day will help keep debris away from the base of your teeth. It is optimal to floss after each meal, so try carrying a small floss packet with you during the day. Your gums need a good brushing along with your teeth. This helps remove any food residue and stimulates circulation. Good circulation to your gums helps get more oxygen and nutrients to feed your gum tissue and keep it healthy. Removing food residue helps prevent bacteria buildup on and inside your gums. Mouthwash can help rinse away bacteria, plaque, and food particles. If you use a mouthwash designed for gum health, it may help to reduce tartar buildup around your gumline. It may also kill off bacteria in your mouth if you use it a few times a day in between brushing. Try to look for ingredients like; essential oils (menthol, eucalyptus, thymol, and/or eucalyptol). Find a small travel bottle to keep in your car or purse for outings. Avoid harsh chemicals in mouthwash like, alcohol. Make sure you get into the dentist for regular teeth cleanings. 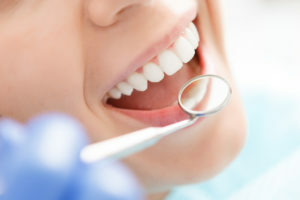 The hygienist will remove any excess tartar from your gumline and deeper into your gums than you can reach with floss. This is one of the most important ways to prevent gum disease. Teeth cleanings are usually recommended once every six months. Oil pulling with coconut oil can help improve gum health and kill bacteria in your mouth. You just take a tablespoon of coconut oil and swish it in your mouth for about 5 minutes. This helps clean your gums and the swishing action helps it move under your gumline to nourish the areas between your teeth and gums. It can also help remove excess food debris from your mouth. The contaminants in cigarettes increase the risk of gum disease. It may even be linked to the cause of gum disease. If you are diagnosed with gum disease, you should quit smoking right away. If you smoke and your gums are healthy, you should begin a quit smoking program to try and stop smoking and prevent gum disease in the future. Many of your commercial oral care products may contain harmful ingredients that can reduce the health of your gums. Strong tooth whitening chemicals and abrasives may be too tough on your sensitive gum tissue. Try opting for a “natural” whitening toothpaste without harsh chemicals, and avoid toothpaste that has synthetic abrasives added. Look for things like; mineral powder, baking soda, myrrh, fennel powder, and xylitol which are safe natural alternatives. Try to eat only small amounts of refined sugar and starchy foods. Moderate your intake of fruits, potatoes, and white rice. Increase foods that are high in vitamins and minerals like; leafy greens, lean meats, and root vegetables. Make sure you eat enough protein to increase healthy gum tissue. Get enough healthy fats and try using coconut oil in your cooking. Switch from margarine to butter, and use olive oil. Try drinking and using bone broth in your meals. The minerals are very good for your teeth and gums. Avoid eating ice. This is bad for your gums and teeth and can injure the tissue. Drink green tea. It contains “catechins” that help fight inflammation in the body. It can reduce gum inflammation in the early stages of gum disease. If you have gum disease, treat it at the outset. It all starts off with Gingivitis. Signs include; red, bleeding gums when you brush, and inflammation. There isn’t much pain and it is easy to ignore. Treatments at this stage are easy with aggressive cleaning, flossing, and deep cleaning by a periodontist. If left untreated, it can progress to periodontitis that requires very deep cleaning in the deep pockets that form. It can even lead to needing your teeth pulled because the gum tissue becomes very loose. Hope these tips on how to get healthy gums can help you get better gum health.